A few weeks ago, while exploring on Pinterest, I came across a really fun site called Glass with a Twist. 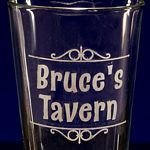 I can remember getting engraved glassware as party favors in college, but we always seemed to have to order hundreds of them. One of the things that I liked when I started to explore Glass with a Twist was the fact that you could order just one or you could order more - the choice is yours. Now, as you would expect, the cost does go down as you order more, so there are advantages to ordering several, but not a requirement. I also really like that most of their glass base is produced domestically by Libbey Glass. (not that it matters, but I bought all of the hurricane glasses for my wedding centerpieces directly from Libbey in Toledo, Ohio when I was planning my wedding. Love supporting Ohio companies.) Their engraving is primarily done with sandblasting, "which produces the best possible effect on glass. Our engravings are deep, even, and permanent." The engravings are fully customizable. 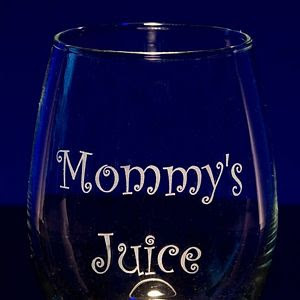 You can take one of the glasses on their site and tweak it to fit your needs or add clip art (they have a wide selection and on some you can upload your own!) or you can consider the glass your canvas and create your own. I think this could be a fun gift to share with others. Know someone that bought a new house or built a new bar? What a fun way to personalize the bar than a customized beer glass or a set. Getting married? 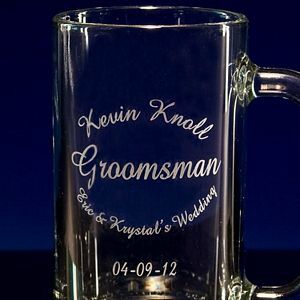 What a fun gift to give to your groomsmen, a commemorative beer mug. Part of a Mommy's group? This could be a fun option for a girl's night out. Know a coffee addict? Or a fan of Irish Coffee? There are so many options and varieties to choose from. They offer beer glasses, wine glasses, shot glasses, coffee mugs, and more. Giveaway will remain open through August 22nd. Giveaway is open to residents of the US only. One winner will be selected through Rafflecopter. The winner will have 48 hours to respond or a new winner will be selected. No compensation was received for this post. Glass with a Twist is providing the set of 4 glasses for the winner. All opinions expressed are entirely my own or that of my family. Ohh, they've got Irish Coffee mugs! I like the 'name' can never have too much caffeine coffee mug. I like the 13 oz coffee mug. These would make a great Christmas gift! I would choose the coffee mugs. I would choose cocktail glasses for my sisters house warming. I would love to have the Clear Coffee Mugs. I would get a morning fix blue coffee mug! Spiral Pilsner Gasses, they are great.. I would want a hurricane glass. The balloon wine glasses. My wine glasses are in a sad, pitiful place. They need to be buried in a shallow grave. I like all of their glasses, but I really need the wine ones. LOL. 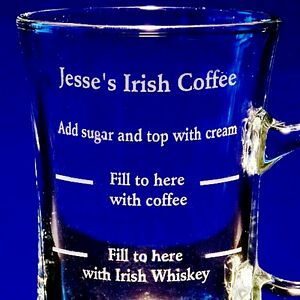 I like the Irish Coffee mugs! A set of personalized shot glasses would be really nice and be a nice addition to our home. Id pick the beer mugs and put individual names on them. We would like the coffee mugs! I like the Caffeine Blue Coffee Mug. Funny! kristiedonelson(at)gmail(dot)com Thank you. I like the beer pint glasses. Thanks for the chance. I think I would get the beer glasses for my husband. 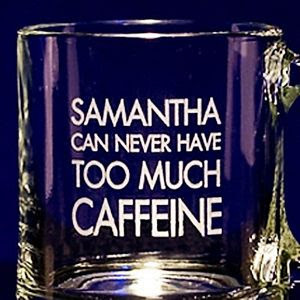 I like the personalized coffee mugs! I like the Clear Coffee mugs! I like the Irish Coffee Mugs. Well I'm all torn! I love the Irish Coffee cups for myself. But when I win, I always end up getting something for one of my kids, lol, or grandkids. ohhhh, maybe I could get these cups & have Papa's Hot Chocolate put on them. They love that. See, I've already made them theirs. Love the Medicine Beer Mug! His and Hers Tall Wine Glasses. I like the highball glasses. I'd love to have the Personal Coffee Mugs.